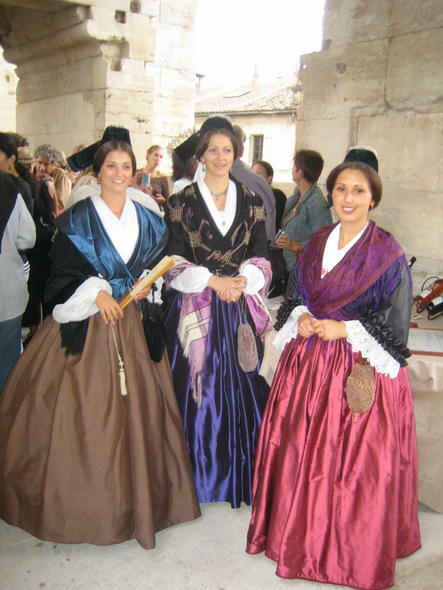 Today I will talk a bit about the costume of the city of Arles and environs. 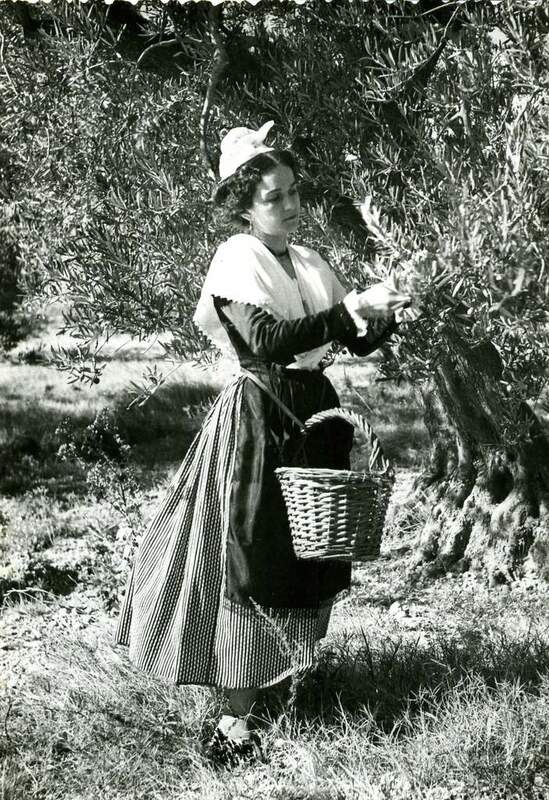 This is part of Provence, yet the costume here is very distinct from that worn in the rest of the Province. 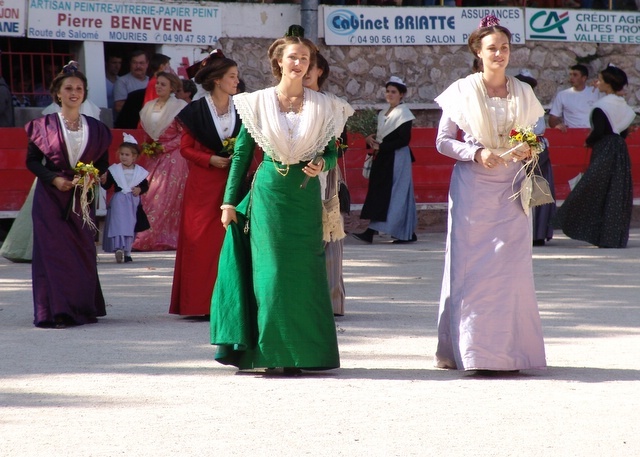 See my previous posting on the costume of Provence. 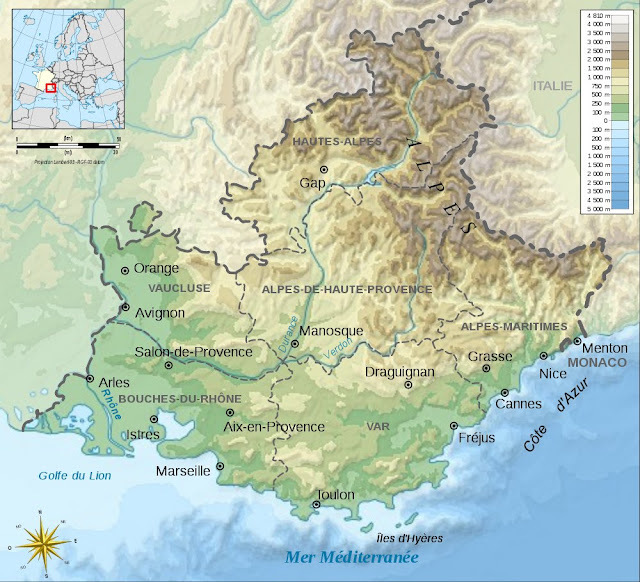 I have seen the costume of this region described as 'simple', as it has clean lines and apparently few components. 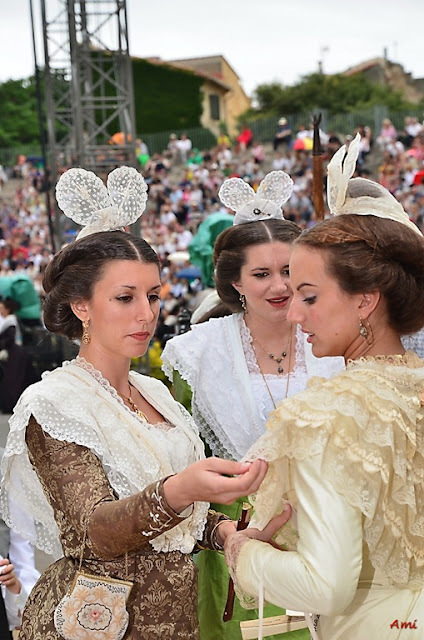 This is an illusion, as in fact the costume is very complex, including the coiffure, which is an integral part of the costume. 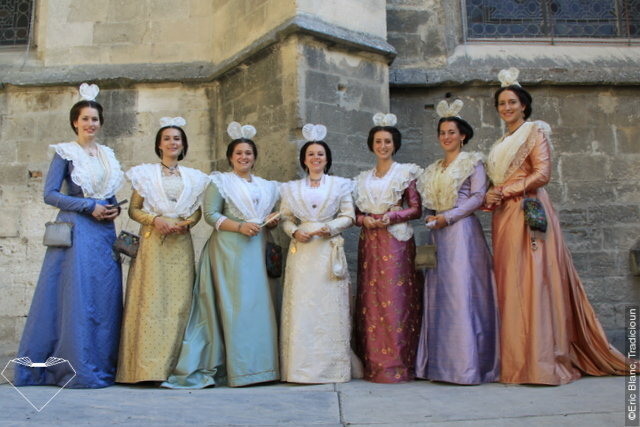 There are four major variants of this costume, based on the headdress, called le costume 1. de bonnet, 2. en cravatte, 3. en ruban and 4. gansé. Of these, the two most common are the costume en cravatte and the costume en ruban, each of which exists in several grades, appropriate for different social classes and different occasions, everything from harvesting olives to the ceremonial procession opening the Provençal style Bullfights [in which the object is to grab a rosette from between the horns of the bull, which is not harmed]. 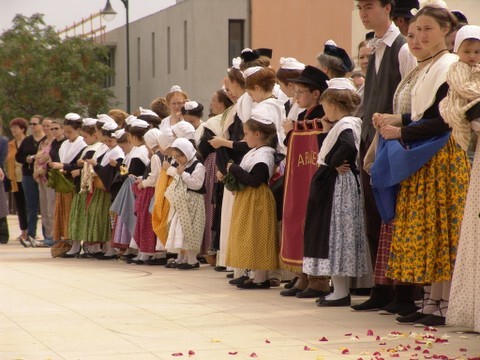 The costume de bonnet is only worn by children, and the costume gansé is only worn by young women for ceremonial occasions. 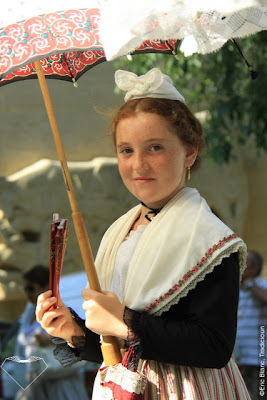 Girls may wear the costume en cravatte or du Mireille as soon as their hair is long enough to put up in the coiffure. 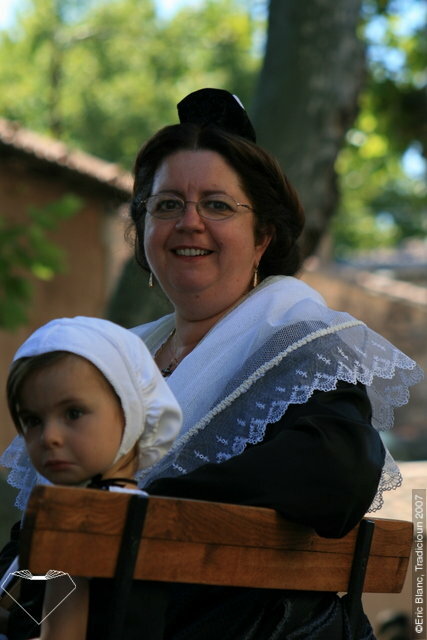 Before that, they wear the costume en bonnet, literally with a bonnet. 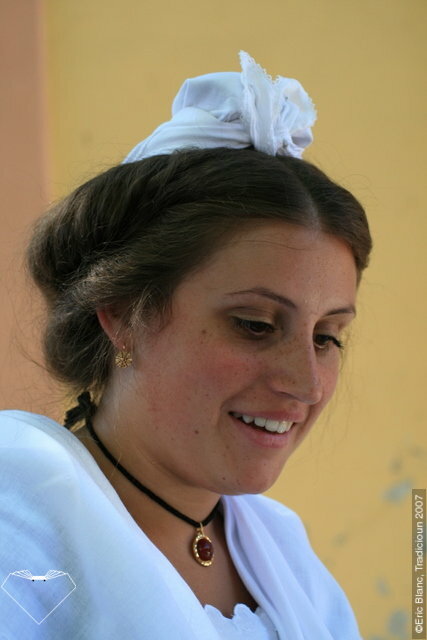 The hair is divided into two parts, right and left, and then each side is divided top and bottom. Each side is then twisted, first separately and then together. 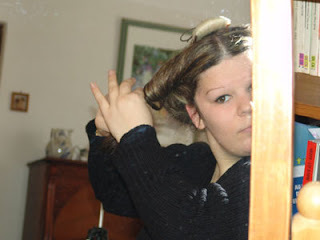 A comb with a small cushion is placed four fingers back from the hairline and secured in place. the ends of the two twists of hair are then secured to the comb from the back. 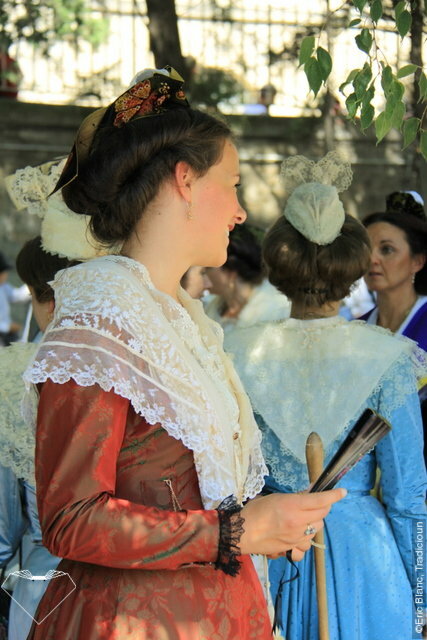 This results in the double cushion of hair on each side which is the hallmark of this costume and makes the composition of the coiffure so distinctive. 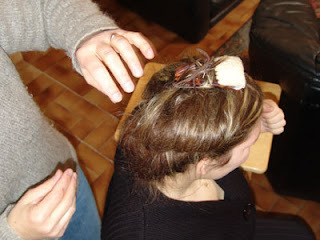 Then the comb, small cushion and ends of the hair twists are covered with a small version of a very typical bonnet cap, with a drawstring drawing it tight. 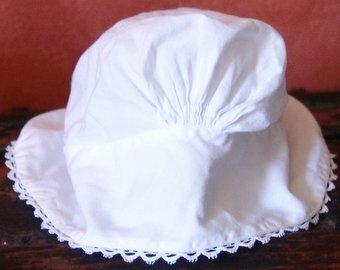 This bonnet may be very plain, or topped with lace or embroidery, depending on the occasion. It is at this point that the different versions of the costume diverge. 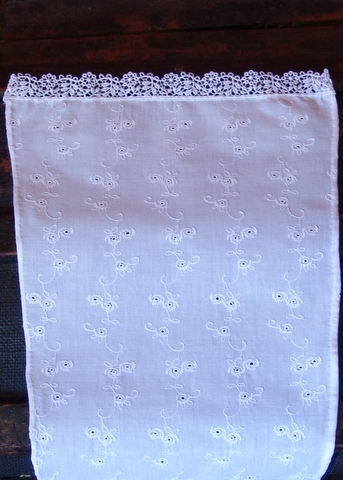 The 'cravate' is a square of cotton or linen, either white, cream or with a small printed design, about 65 cm on a side. Two opposite corners are folded towards the center, and then each side is folded over and over until you have a narrow ribbon. 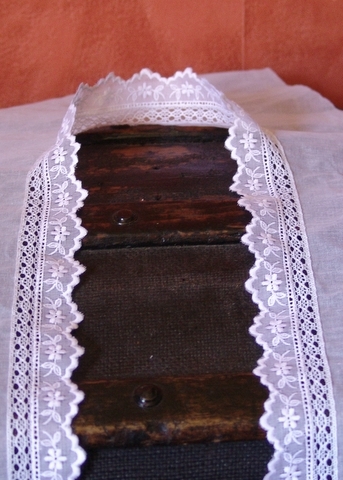 The remaining corners may be ornamented with embroidery or lace. 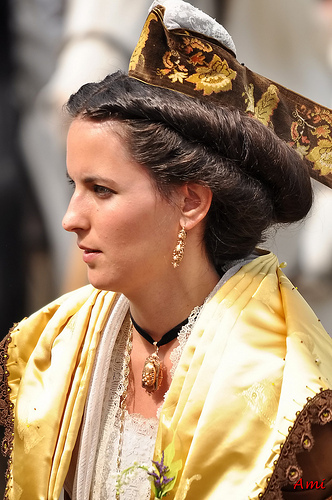 The center of this is pinned to the front of the coif, wrapped around to the back, where it is pinned again, and then the loose ends continue around to the front and tied so that the ends stand up in front of the coif. 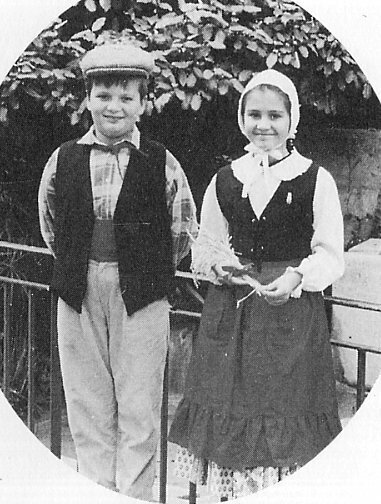 This version of the costume is considered the least formal, and is the one worn by peasants in the region. It is also worn by city women for everyday, but it may be dressed up to some extent. 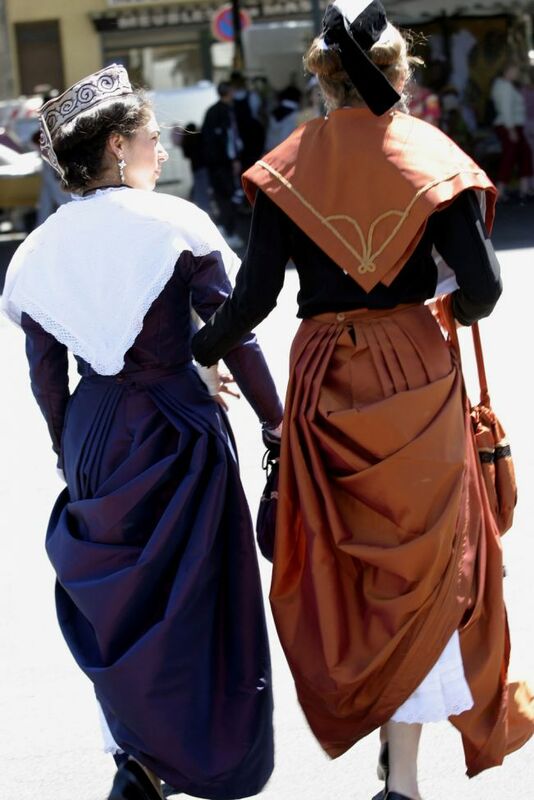 Exactly how much ornamentation and what type of cloth is appropriate for which occasion and which social class is subject to very detailed rules which I will not go into. 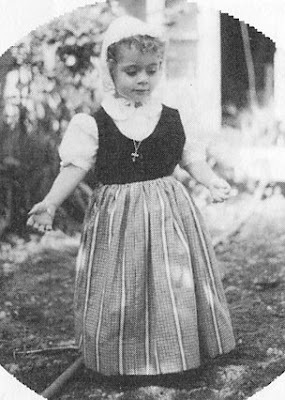 Stockings, bloomers and one or more petticoats form the base of the costume. 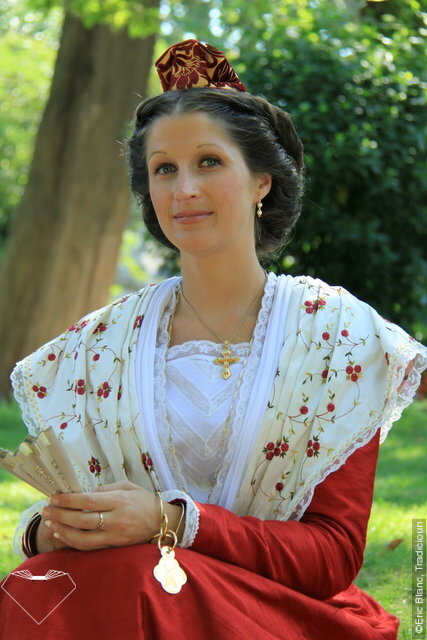 The bodice, which is called Eso is usually black, and for the costume en cravate is of cotton. It almost always has long narrow sleeves, except for little girls and possibly for working outside for peasants. It is closed on hooks, and comes somewhat below the waist. 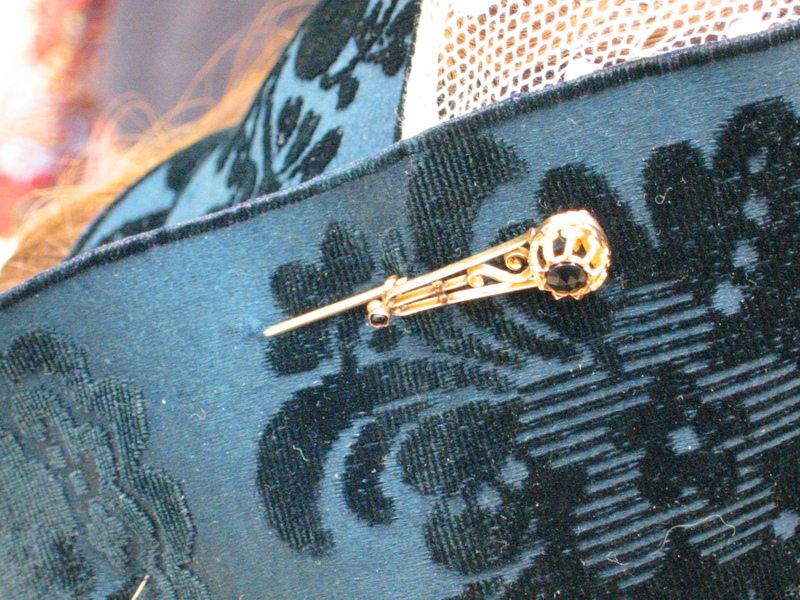 A cotton or linen front, 'Plastron' or 'Estomac', is pinned on. This may just be a plain rectangle, or it may have edging of cutwork or lace, and may be ornamented down the center, depending on the formality of the occasion. 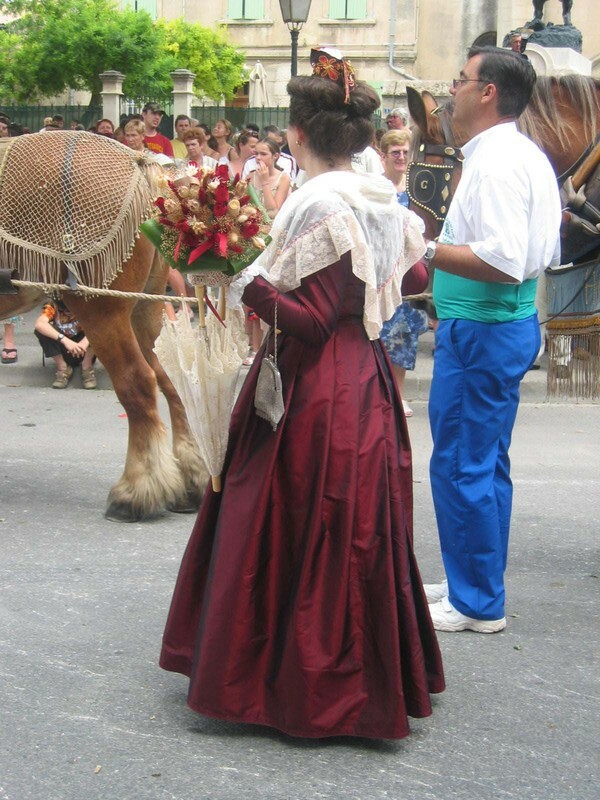 A skirt is worn over the top of the esa and plastron, For this costume it is generally circular, or rather cylindrical, and should be 3.5 m around or more, and the closure is either in front or on the side. 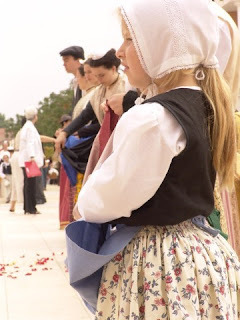 For country people, everyday, or dancers the hem is mid-calf, for city people or more formal occasions the hem is more like ankle length, and of course of finer quality cloth. 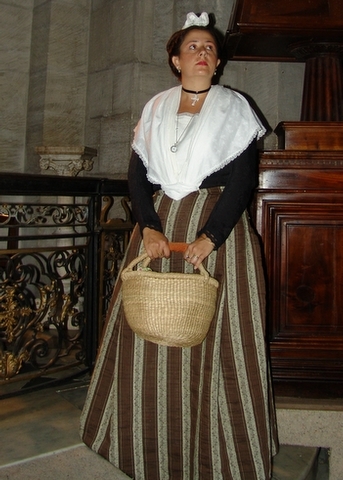 An apron is usually worn with this costume, either black or with a small printed design, generally in quiet colors which complement the rest of the outfit. A wider, more enveloping apron is considered less dressy. There may be pockets on the front. 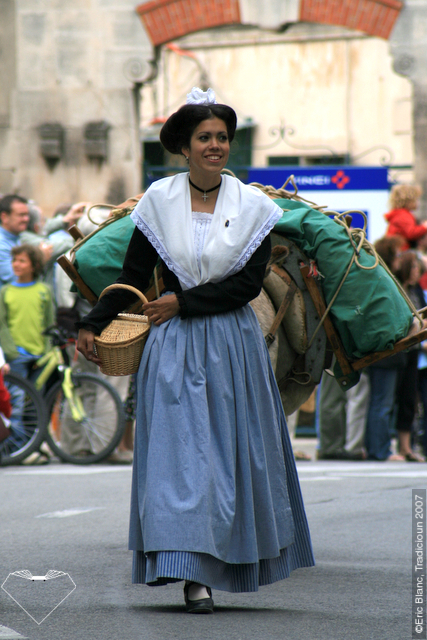 Shoes or espadrilles are worn with this costume. A fichu is folded in half, and folded several times and pinned to the shoulders, two pins behind the neck, one on each shoulder and another close to the tip, which should fall just at the waist. This is usually white or off white, but may occasionally match the apron. 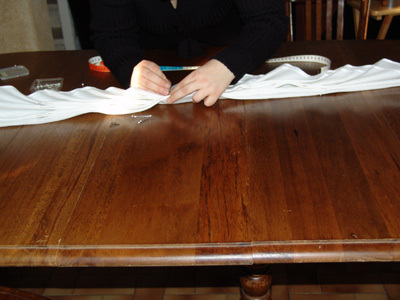 The ends are pinned at the waist, and then are wrapped and pinned around horizontally to make a small horizontal pad which finishes the front. 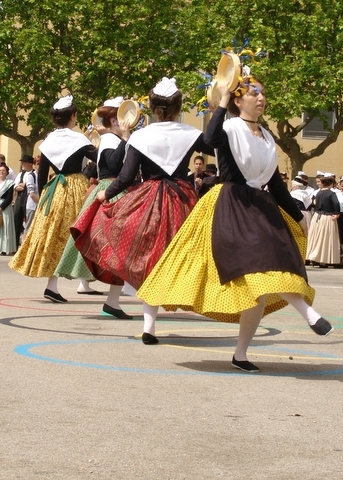 The skirt is gathered more fully in the rear. 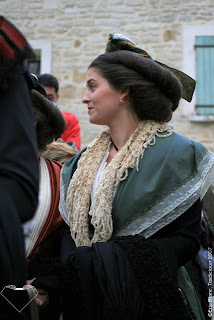 A cross on a velvet band is an integral part of this costume, as it is for so many French costumes. 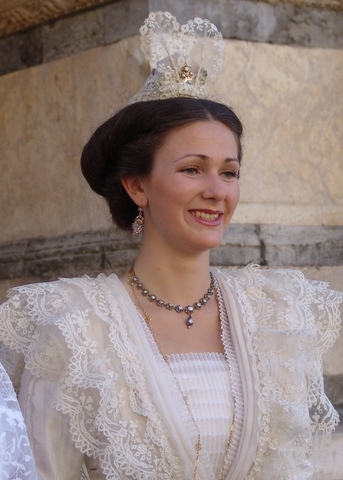 Other jewelry may be worn which is appropriate for the occasion. At the age of 15, a girl ceremoniously 'takes the Ruban', and wears this costume for the first time. 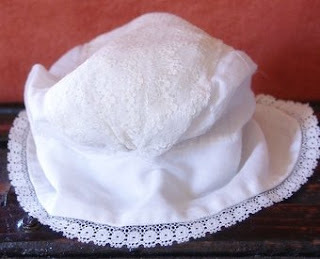 The tiny bonnet is replaced with a rectangle of cloth, usually ornamented in the center, which is gathered on pins front and back and fastened to the comb. The ruban itself is a wide ornamented ribbon which is wrapped around the coif and pinned in place with one end extended towards the back. 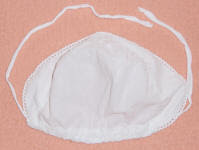 This is formed carefully to have a concave front and pinched sides just behind. Most of the time it is dark blue, but may be in other colors for more formal occasions. 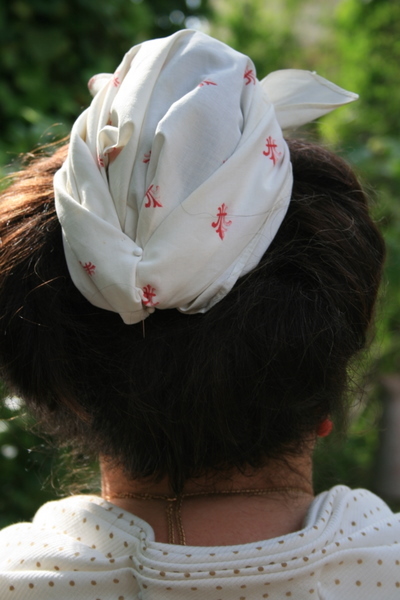 Older women may forgo the coiffure, and simply pin their hair up in a bun, and then use a larger coif, and wrap the ruban around the edge rather like a turban. 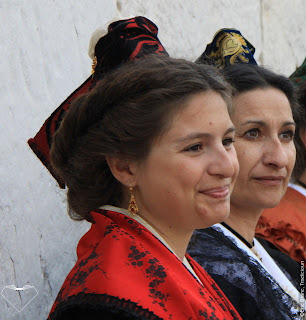 The eso is usually black, of finer material with lace on the cuffs for sundays or holidays, but for special occasions it may match the skirt. 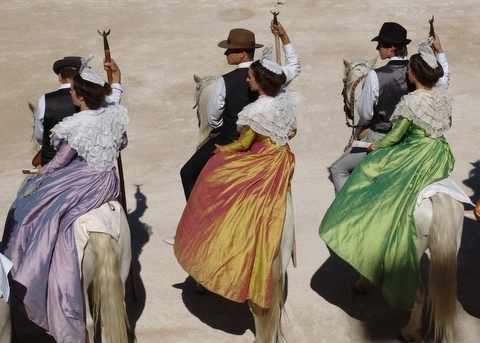 The plastron may be very fancy when appropriate. 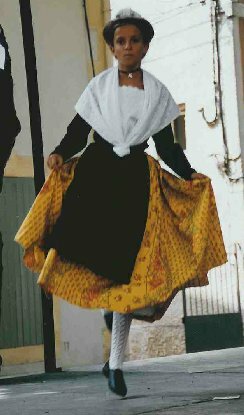 Except for the everyday costume, the skirt is often flared, fitting closely in front, and full of deep pleats and closing at the back. 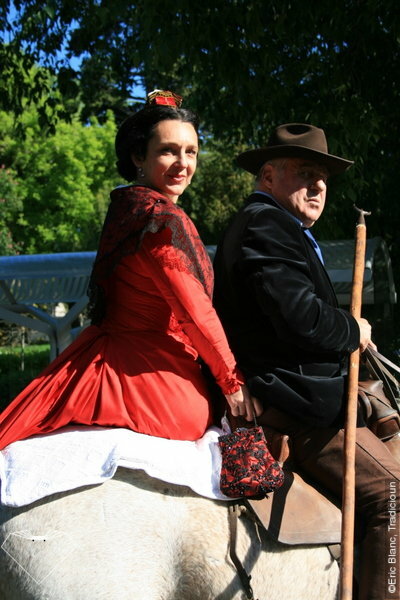 For formal occasions there may a be a train. An apron is seldom worn with this costume, except for everyday or going to market. 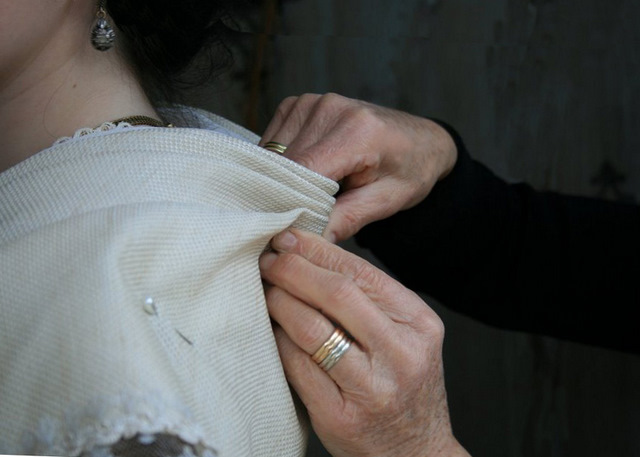 Except for the everyday costume, over the plastron a second garment is pinned. 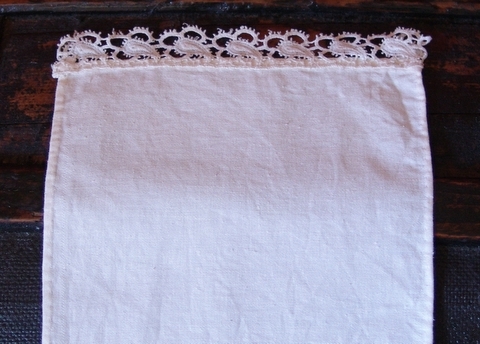 This is called 'guimpe' and consists of a piece of linen with an edge of lace which stands up. When fully dressed, the lace edge is all that is visible. 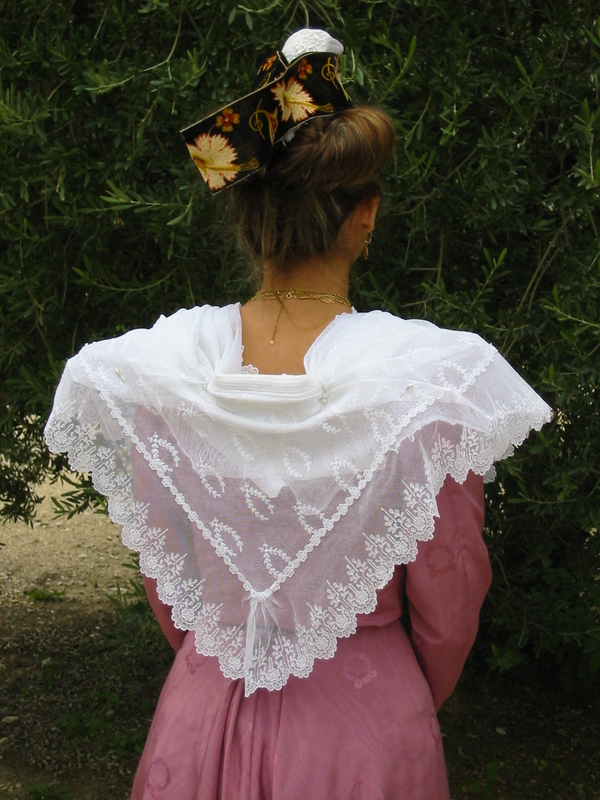 A light, thin 'fichu de dessou' is then pinned around the edge of the guimpe. 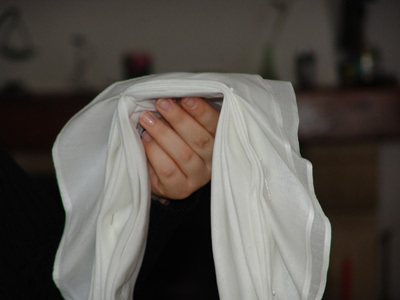 This is folded many times and is primarily to give fullness to the ensemble. This is usually white or cream in color. 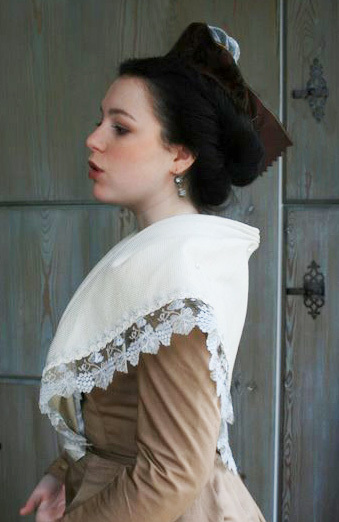 Another shawl, the 'fichu de dessu' is also folded, although not as completely, the folds are pinned in the center, to form it behind the neck and then pinned on over the shoulders and near the tip, which should fall exactly at the waist. 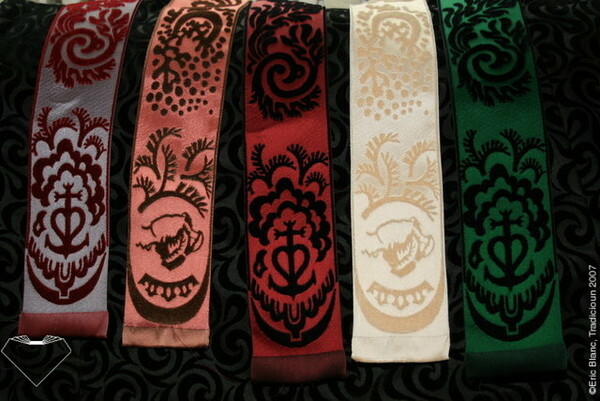 This may be of various colors to complement the ensemble, and may be highly ornamented, depending on the occasion. 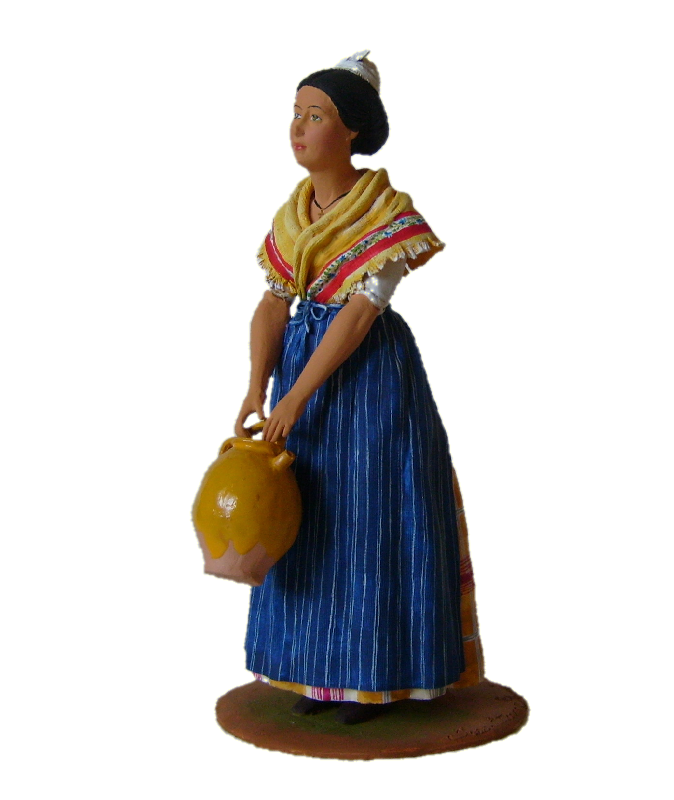 This is often the focus of the outfit..
A matching or complementary handbag in the shape shown just above is standard with this costume. 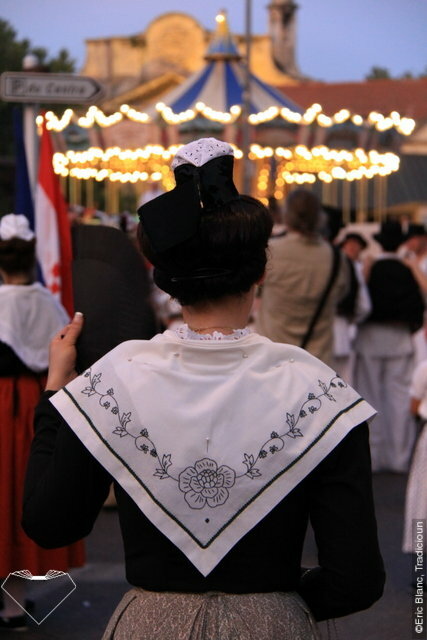 The costume 'gansé' is similar to the most dressy version of the costume 'en ruban'. 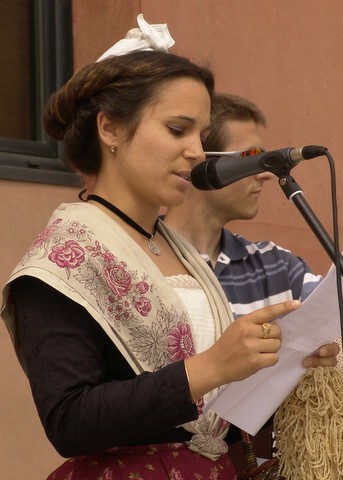 The ruban is replaced by a narrow ribbon of lace which is wrapped in a manner similar to the cravate, with the ends tied in front and standing up as small lace rabbit ears. 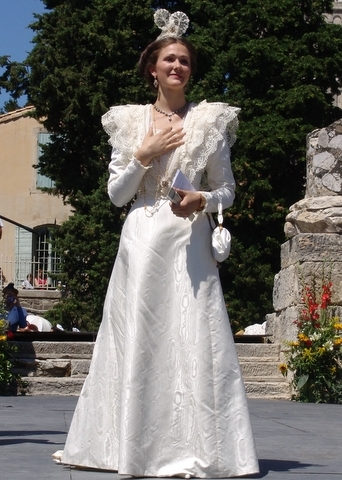 The top fichu and the plastron are covered with rows of lace sewn on as flounces. 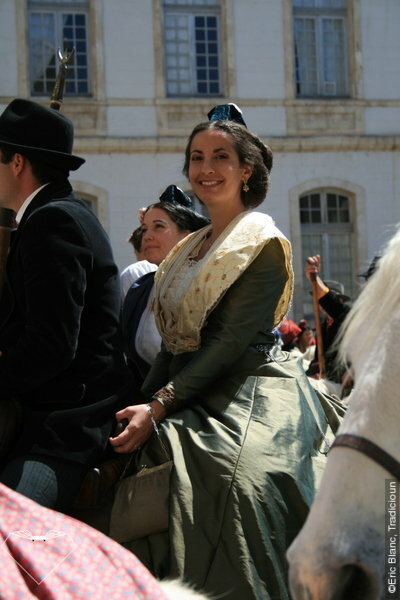 The skirt usually has a train and is made of the finest cloth and is accessorized with fine jewelry. 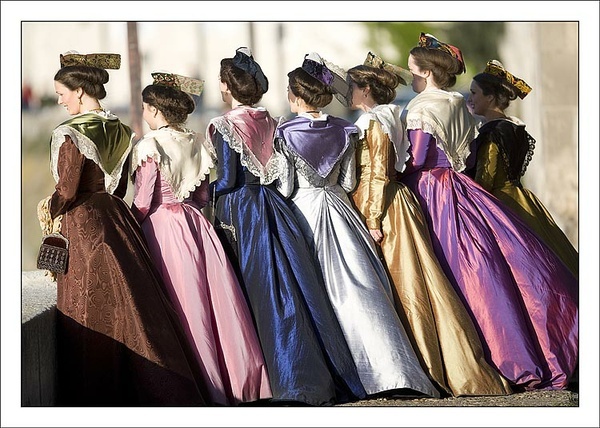 This costume is only worn by young women for the most formal of occasions. Thank you for reading, I hope that you have found this interesting and informative. 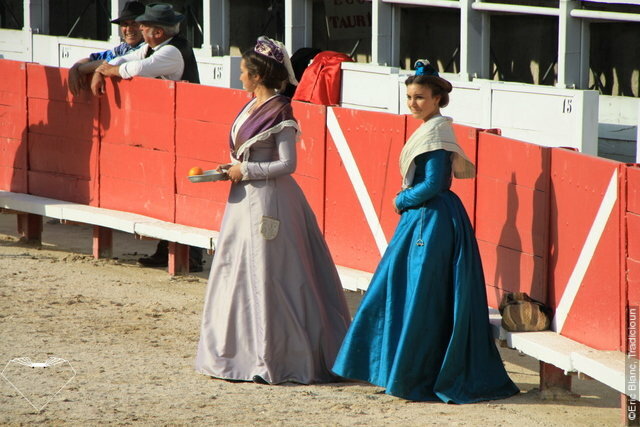 I give great thanks to those who have posted so many wonderful photos of this costume online. I also salute those who keep the tradition of this most artistic costume alive. 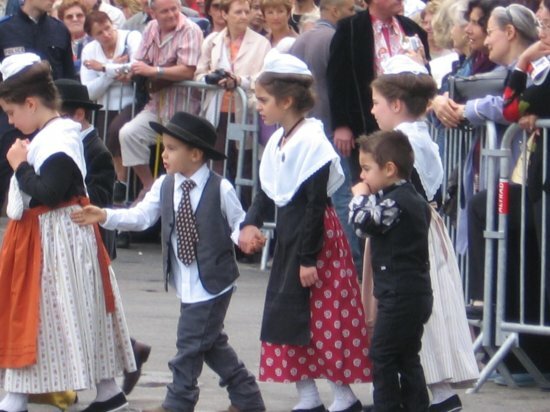 Here is a website dedicated to the art of the costume and culture of the Arlesien region. I have drawn on this website for much of my material. 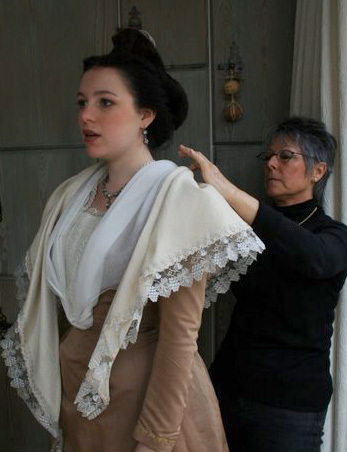 A video in four parts which shows step by step how to put on this costume. It is in French. Feel free to contact me at this email address. You have absolutely no idea how helpful this has been for me in making a costume for a National dance competition! Thank you!